Who came out on top between Henry Cejudo and TJ Dillashaw? The UFC’s first show under the ESPN banner is in the books, and it was a pretty good one to start 2019 with. Pretty much every fight on the show delivered the goods – albeit perhaps not in the way that the UFC brass might’ve wished – and while the show might’ve posed more questions post-fight than it did answers, that’s not always a bad thing. Here are the best and worst moments from UFC Fight Night 143: Cejudo vs. Dillashaw. 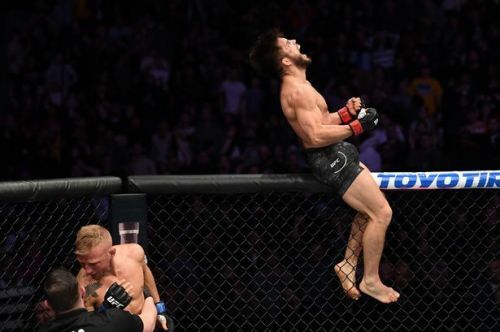 Given Henry Cejudo only won his UFC Flyweight title with a highly contentious decision over Demetrious Johnson, it was understandable that plenty of people were underestimating him going into last night’s fight with TJ Dillashaw. But the Olympic gold medallist came out with the bit between his teeth and immediately proved any doubters wrong with a resounding knockout of the Bantamweight champion just seconds into the fight. Sure, there were a couple of questions surrounding the stoppage – more on that later – but nobody can really play down what Cejudo did last night. Prior to the fight, people were talking about Dillashaw as one of the all-time greats, and yet Cejudo iced him in under a minute. He didn’t even need to use that vaunted wrestling game to win the fight. 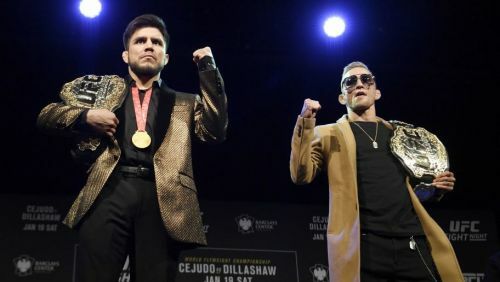 Where Cejudo goes from here is a bit of a question mark; he’s spoken about this fight “saving” the Flyweight division from the possible cut that has been rumoured for months now, but post-fight it appeared that the talk was of a rematch with Dillashaw, but this time with TJ’s title on the line. If that happens then the future of 125lbs would immediately be questioned again, but that’s a story for another time. At any rate, nobody is going to be underestimating ‘The Messenger’ again anytime soon.